Tulips. The prettiest of spring flowers. I have been enchanted by these delightful lovelies ever since I first saw them. Not in real life (there are no tulips in Mumbai), but on the silver screen in Yash Chopra's Silsila. Any Bollywood buff will know what I am on about. What romantic could possibly resist Amitabh Bachchan and Rekha cavorting to the strains of 'Dekha ek Khwab' in the tulip gardens at Keukenhof. I digress. Autumn is the time to plant tulip bulbs in your garden. So M and I readied ourselves to get planting on a sunny weekend in September. The idea, my idea, was to let M do all the digging, while I pranced about, ceremoniously placing the tulip bulbs in just the right spots. I had Keukenhof to live up to, after all! When both parents are trying to get a job done, it is invariable that the tot volunteers his invaluable assistance. You have no choice but to accept the gracious help being offered. 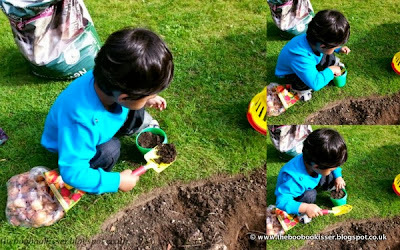 On the plus side, your garden is perhaps the best place that your tot can be of help without getting into too much trouble. It is by far the best place for messy play; you do not have to worry about tidying anything up after. It is quite amazing what abundant happiness a simple, basic, plastic garden set can bring. 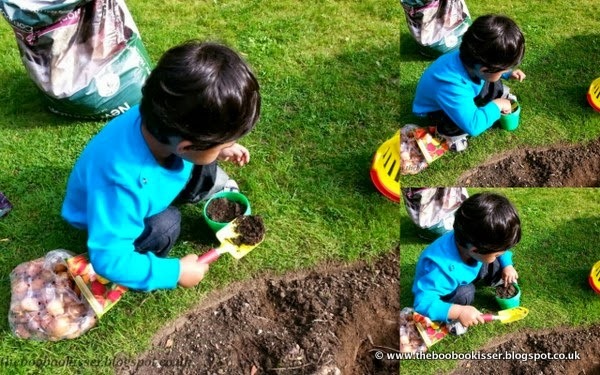 J got digging with M. He got planting with me. He even managed to plant his own little tulip bulb in his own little garden pot. All by himself. With absolutely no help. There could not have been a better way to foster his independence. Tulips. My favourite of all the spring flowers. We may not have planted a Keukenhof, but our tulip garden has already brought us much joy this autumn. Especially the one little bulb in a little green pot that will bloom this spring. oh what a lovely post, planting spring bulbs is such a fun thing to do, they always promise so much for the next year. I love tulips too and always look forward to seeing them start pushing up through the soil. Thanks Nichola. I love the way they add so much colour to the garden. Not to mention herald the end of winter. Love the song!!! We've got alliums to plant and I'll be letting the kiddies help too. I had a little helper in my garden today too! Tulips are such a beautiful flower. I hope they'll be patient waiting for them to grow! oh, he toddles out to check on his garden planter every day! Just hope the frost doesn't get it. Got some really cheap at the local supermarket. And some pricey ones from the garden centre! one place where they can do what Mums and Dads are doing without getting into too much trouble!